Professor Verhoeven is one of Australia’s leading proponents of Digital Humanities research. 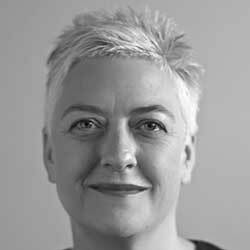 Her work is internationally recognised and evident in her recent appointment as Chair of Digital Humanities 2015. Verhoeven’s research addresses the vast amounts of newly available ‘cultural data’ that has enabled unprecedented computational analysis in the humanities and in aprticular in the creative industries. In addition to scholarly publications and media appearances, she has focused on the development of national online research resources such as the Humanities Networked Infrastructure Project (HuNI); the Cinema and Audiences Research Project (CAARP) database; and The Ultimate Gig Guide (TUGG) an online archive of live music information. In 2010 this work was recognized with the Australian Teachers of Media Best Tertiary Education Resource Award for bonza: an online film and TV research resource. Verhoeven is a founding executive member of the Australasian Association of the Digital Humanities (aaDH) and the Tasmanian Government’s Digital Futures Advisory Council. With Mark David Ryan, Ben Goldsmith, Stuart Cunningham, "The Australian Screen Producer in Transition", in Beyond the Bottom-Line: The Producer in Film and Television Studies, (eds) Andrew Spicer, Anthony McKenna and Christopher Meir, Continuum. "Film, Video, DVD and Online Distribution", in Media and Communication in Australia, 6th edition (eds) Stuart Cunningham and Sue Turnbull, Allen and Unwin, Sydney. With Colin Arrowsmith, "Mapping the ill disciplined? Spatial Analyses and Historical Change in the Post-War Film Industry" in Locating the moving image: new approaches to film and place (eds) Julia Hallam and Les Roberts, Indiana University Press, Bloomington, pp.106-129. "What is a Cinema? Death, Closure and the Database" (in press), in Watching Films: New Perspectives on Movie-Going, Exhibition and Reception (eds) Albert Moran and Karina Aveyard, Intellect Books, pp. 33-51. "Film distribution in the diaspora: Temporality, community and national cinema", in (eds) Richard Maltby et al, Explorations in New Cinema History: Approaches and Case Studies, Wiley-Blackwell, pp. 243-260. With Alwyn Davidson and Colin Arrowsmith, "A method for the visual representation of historic multivariate point data", in Advances in Cartography and GIScience, volume 2: selection from ICC 2011, Springer-Verlag, Berlin, Germany, pp.163-178. With Colin Arrowsmith and Alwyn Davidson, "Exhibiting the exhibitors: Spatial visualization for heterogeneous cinema venue data", The Cartographic Journal, Accepted August 5, 2014. With Colin Arrowsmith, "Visual methods for showing cinema circuits at varying temporal and spatial scales", in Colin Arrowsmith, Chris Bellman, William Cartwright, Simon Jones and Mark Shortis (ed.) Proceedings of the Geospatial Science Research Symposium, Melbourne, Australia, 12-14 December 2011, pp. 1-15.